We were thrilled to be able to add Amora to our herd in 2015 as a first freshener. She ties together several lines we have successfully been working with (POF Royal Marcus and Wingwood's Timothy). Her dam, Amira, milked through on her first lactation an impressive 453 days. She came to us with an impressive junior show record and hopefully will continue this into her senior career. 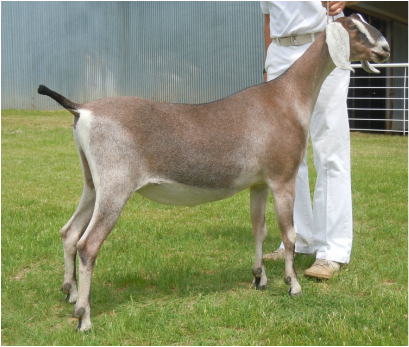 She has been bred to our Dexter (Timothy x Jane son) for 2016 kids.